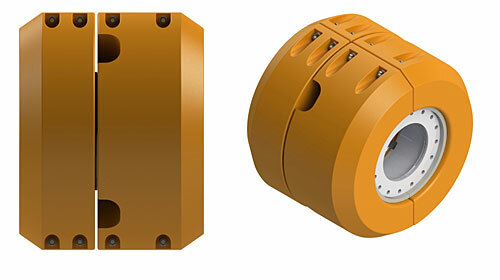 Gall Thomson, specialist in the application, design and supply of Marine Breakaway Couplings (MBCs) has introduced a neutral buoyancy float for MBCs. UltraFloat has been specifically designed to fit around the external profile of the MBC. When two are fitted to an MBC they provide neutral buoyancy, eliminating any reduction in buoyancy on the adjacent hoses. UltraFloat is the most advanced and operationally efficient float on the market. Shaped to reduce drag it also provides a simple secure attachment and features four inspection windows to assist inspection of the MBC split line. UltraFloat will provide increased operational efficiency in all Marine Breakaway Coupling applications whether they be SPM, FSO, FPSO, FSU or in other offshore oil terminal production and bunker floating hose strings. Gall Thomson designs, manufactures and applies anti-pollution and safety Marine Breakaway Couplings. These provide a safe parting point in marine hose transfer systems, automatically shutting off product flow and preventing system damage if there is an extreme pressure surge or excessive tensile load on the hose string. These are engineered solutions that minimise the risk of spill and protect against operational downtime, workforce injury and damage to assets, reputation and the environment.